Inside Castle House you can see and enter two Victorian custody cells. This is where suspects would be remanded after being arrested and before their cases were heard. Those found guilty would go to the large jail which occupied most of the Carmarthen Castle site, or to other institutions. Some were executed at the jail. Castle House was built as a police lockup. It was completed c.1860 where an infirmary previously stood, between the castle’s inner and outer walls. You can visit the cells whenever Castle House, home to the local tourist information office, is open. One of the cells has no artificial lighting, to give you an idea of how it felt to be in custody here. Photos of the faces of criminals or suspects are displayed on the walls inside. They come from the Carmarthen Register of Felons, which recorded people processed here. Prison governor George Stephens was one of the first in the world to realise that the new technology of photography could create a useful official record of suspects’ faces. 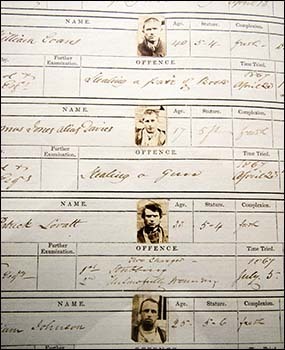 Many criminals would go on to reoffend and give false names when caught, but the mugshots would enable the authorities to identify people who had been convicted previously under a different name. Mr Stephens was a keen photographer. He was with the Metropolitan Police in London before being drafted in to Carmarthen to help deal with the Rebecca Riots, which started in 1839 with the destruction of a tollgate at Efailwen. Some of the rioters were held in the cells here. Mr Stephens managed the town’s prison for 33 years and died, aged 81, in 1897. His first photograph of a felon was of James Jones, a weaver who was sentenced to be hanged in 1858 for attempted murder. The picture on the right shows part of a page of the register from 1867. The suspects’ faces appear alongside their personal details and the offences with which they were charged.